The logo is much more than just a pretty image to put at the top of a company’s stationary set. It gives customers an impression of what the company is trying to project to the world and what the company’s business is. It is the most important branding tool that a company can have in its possession. A logo consists of imagery and/or word(s). It can be just the one or the other, or it can be a combination of both. When just the company’s name is used (this is called a wordmark) it is designed with a font that gives an indication of the type of company. Is the company traditional, modern, trendy, etcetera? This will be shown in the type of font used, for example a sans serif font (plain) has a more contemporary feel, while cursive type fonts tend towards a more traditional feel. The font is often altered to be more unique to the specific company, for example the last letter could be extended to become a flick. Different colours bring out different emotions and associations and a designer will strive to portray the characteristics and qualities of the company. Certain well-known colour combinations also portray meaning, for example if you use the colours of your country’s flag, you indicate that your company is patriotic — or that you are trying to form an association with the country. A logo is not a fixed-in-stone item either, with most companies developing and evolving the logo to better suit the company’s image, or to show how the company itself has changed direction. One of the first steps when starting a brand is to choose an appropriate name. Founder and MD Andrew Baxter thought CAPESTORM the ideal name for the outdoor brand. 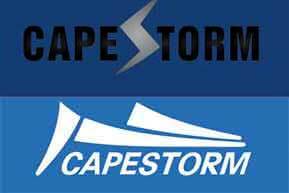 Not only does it conjure up images of the winter storms that led to the name Cape of Storms, but it also associates itself geographically with South Africa and CAPESTORM’s home base is in Cape Town. The first logo was a wordmark with a lightning bolt representing the S in Storm. At that stage they did not think too much about the design of the logo and used what first came to mind. 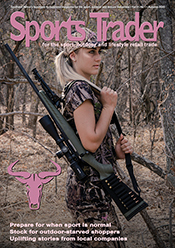 This logo was used for quite some time and you still see people wearing CAPESTORM products bearing the old logo — in fact the owners of these early products often remark with pride that they own an original CAPESTORM product and they seem to derive great pride in being associated with the brand all the way back to its roots. Later, as the business became more sophisticated and diverse, they realised that the logo did not only look slightly amateurish, but that the lightning bolt was not distinct enough — with people wrongly reading the name as CAPE TORM. So, they went back to the drawing board and asked professional agencies to submit creative ideas. Various types of designs were brought to the table, but none worked. CAPESTORM wanted an unique logo that would harmonise with the word, but not be too limiting or one-dimensional. They did not want to use a compass or a mountain peak or any other recognisable icon, because they felt this would be restrictive and unoriginal. In the end Baxter’s wife, Lisa, sketched out a logo with a stick in the wet sand along the banks of the upper Oliphant’s river in the Witzenberg Mountains. They worked with that design and digitised it and the result was similar to today’s logo, except that the points on the flashes were sharper and the typeface has been modified slightly — these changes were introduced five years ago. The meaning behind the logo? It really depends on who looks at it: climbers see mountains, surfers see waves, sailors see wind, visitors to Cape Town recognise Table Mountain. This is exactly what CAPESTORM wanted. They wanted a brand for all their diverse customers and this logo combines all the diverse interests in one. In 1989, Converse for the first time changed the look of their original logo after 84 years of trading by moving the position of the star. Originally, the star had been in a circle, but they moved it to become the centre of the “o”. The star was coloured red. The original styling was kept for the point of sale material, the abbreviation Cons used for court shoes and the Chuck Taylor seal for the All Star shoes. Today, we are in the Converse Century, which was lauched in 2008. 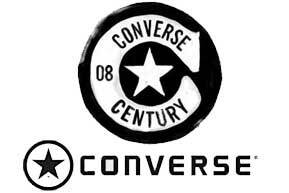 In the new logo, the words Converse Century are written on a big C, which in turn sits on a black, rougly drawn circle. Inside the “C” sits The star sits inside the C, in a contrasting white colour. 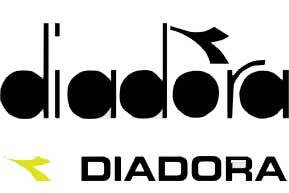 The name Diadora has a Greek origin and means to share gifts and honour. The sharing of successes, the concept of team in a competitive situation, and the respect for both teammates and opponents, became staples of the Diadora trademark. The old logo had a soft rounded look to it with the letters all in lower case. The font was rounded and their logo detail was placed above the o. The latest logo looks clean and modern — all in caps in a blocky font with their logo detail to the left of the word. 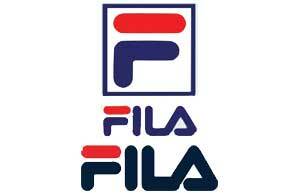 In 1972, Italian brand Fila hired a Japanese artist to design their logo. The result was similar to the distinctive logo of today — a capitalised F enclosed within a block standing guard over the Fila name. The name was placed underneath the block-F, which was sometimes used on its own. The artist used blue and red. Today the blocked-F has dropped away and the logo is entirely a wordmark. In the mountaineering world first ascents are considered to be the most credible achievement. After all, everybody knows who were the first people to ascend Everest — hardly anybody remembers who were in the second or third parties. Hence, naming his company First Ascent was a natural choice for founder Charl Gold. Designing the logo was a bigger challenge. Considerations included using a panther, elephant or a tiger. In 1989, on a research and development trip to New Zealand to see where some of the world’s best down-filled sleeping bags were being produced, Gold came across a lizard on the New Zealand one dollar coin. Lizards have a resilient skin and are masterful rock climbers; they have been around for millions of years and are generally tough creatures. What better characteristics to associate the mountaineering brand with? Another characteristic on the logo is that the f of First Ascent is spelt in a lower case on the logo. This is because the word first had to fit neatly below the lizard’s foot and the mountain on the original logo. The logo has been in constant change since 1989 — changing four times, including the latest change in 2008. In 2005 the logo colour was changed from blue to a more exciting red. This came after intense research into colour association, which showed that blue is associated with calmness — almost the opposite association to what the brand would have liked to project. The research showed that successful brands make use of bold colours, for example oranges and reds, and that red represents excitement, action and adventure. 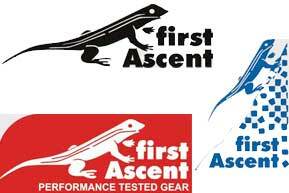 First Ascent decided to change their logo colour from blue to red. The latest change happened in 2008 when they introduced the curved corner design for print media. The standard logo is still used for branding on garments. 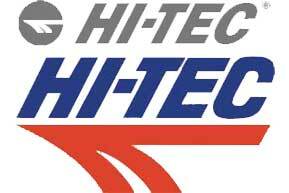 HI-TEC’s original logo was designed by founder and chairperson, Frank van Wezel. However, HI-TEC was known as INTER when Van Wezel first started manufacturing squash shoes 35 years ago, after he heard fellow squash-players complaining about their shoes. In 1982, when the UK squash shoe had made enough of an impact on the market to warrant an aggressive international marketing campaign, that the ad agency J. Walter Thompson suggested that INTER was not a good name for a brand. INTER suggests something in-between — you need a name fitting for a market leader, that suggests a more exclusive, upmarket product… and the resultant price increase will pay for the marketing campaign, they bluntly told him. It made sense, but Van Wezel was concerned about changing a brand name and logo that British squash players and hikers had learnt to trust. How did they solve this dilemma? Simple: they changed two letters in INTER to create HI-TEC, a name more fitting for a technical footwear brand. The change was so subtle that many existing customers did not realize, and continued buying the footwear, because they recognised the logo. However, the real proof of the pudding was when new consumers and sales added up so much that six years later HI-TEC listed on the London Stock Exchange. The harpoon detail on the logo grew out of practical needs. HI-TEC needed to reinforce the side quarter of a squash shoe to offer more support in the upper — and thus the harpoon was born and designed to fit the contours of the shoe. The harpoon was inspired by the characteristics associated with speed and direction, two essential ingredients needed when playing sport. The logo has evolved over the years to ensure that the company stays fresh and up to date. Today it is registered in 91 countries. Founded in 1906 as the New Balance Arch Support Company by William J. Riley, New Balance was sold in 1972 to current chairperson Jim Davis. The following year he designed the company’s logo. 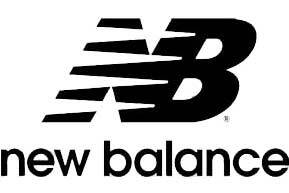 Shortly thereafter, Davis asked New Balance’s ad agency, Heckler & Associates, to come on board and they redrew the logo. The new logo showed fewer wings, or points. The story of the Nike swoosh has become a design legend. The famous logo was designed by then-Portland State University graphic design student Carolyn Davidson in 1971. Davidson met Nike founder Phil Knight while he was giving accounting classes. Knight’s company, Blue Ribbon Sports, was on the point of introducing a new athletic footwear brand in 1972 and needed design ideas, which Davidson agreed to provide at a rate of $2 per hour. Her final bill came to $35. But, in 1983 Knight presented her with a gold swoosh ring and an envelope filled with Nike stock to express his gratitude. Knight originally did not like the swoosh, but accepted it due to deadline constraints — expressing the opinion that it will grow on him. It not only grew on him, but also on most of the athletic footwear and clothing still sold across the world. The logo represents the wing of the Greek Goddess of victory, Nike, who was the source of inspiration for many great and courageous warriors. The logo first appeared in 1971. Then, a cursive lower case Nike word was printed over the checkmark. 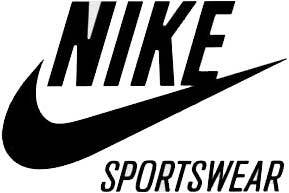 In 1978 the Nike word was moved to just above the swoosh, but still touching it. The letters were converted to upper case. Today the swoosh is so well known that it is not needed to identify it by name. In 1948 the Dassler brothers, Rudolf and Adolf, founded two iconic footwear manufacturing companies: adidas and the company that became known as PUMA. Rudolf Dassler’s company was originally named RUDA — a combination of the first two letters of his name and surname. However, this name did not stick and he soon changed it to PUMA — combining both his passion for sports and wild cats. The puma cat image resembles speed, strength, suppleness, endurance and agility — all attributes needed to be a good athlete. 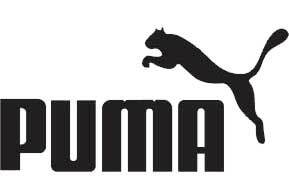 The original logo featured a puma jumping through a slim D (for Dassler). The logo is now making a comeback in one of PUMA’s latest brands, the heritage collection Rudolf Dassler Schuhfabrik. In 1957 Dassler introduced a sans-serif typeface — designing a word and picture logo at the same time. The following year the second brand logo was patented: the formstrip. The formstrip was originally created to stabilize the foot in the shoe, but is now a well-recognised PUMA trademark found on almost all PUMA shoes, as well as certain other products. The logo with the jumping cat was created in 1968 by Lutz Backes, a cartoonist from Nuremberg. Since 1979, the puma has been depicted jumping across the upper right hand corner of the word logo, changing slightly over the years. The eye and muzzle have been removed and the ears are more pronounced in today’s logo. Before 2000 the logo was used in a green colour, but today it is only used in black, silver and white and surrounded by the company’s colour: PUMA-red. Different colours evoke different emotions and connotations when you see them. The colour chosen for a logo can therefore influence how people perceive a brand. Red: heat, intensity, passion, danger, speed, blood, aggression, excitement, action, adventure, love, food. Blue: peace, tranquillity, loyalty, trust, harmony, confidence, power, calmness, success, trustworthiness. Yellow: faith, goodness, friendship, optimism, happiness, imagination, cheerfulness, playfulness, curiosity, amusement. White: cleanliness, purity, youth, simplicity, innocence, peace, simplicity, cleanliness, innocence. Green: growth, money, humility, ecology, earth, harmony, health and healing, nature and animals, money. Orange: luxury, passion, exotic, enthusiasm, vibrancy, affordability, fun, youth, creativity, celebration. Purple: richness, royalty, mystery, spirituality, justice, fantasy and dreams, justice, royalty. Brown: earth and nature, simplicity, seriousness. The way that a logo identifies a brand in a market is best illustrated by the current litigation between SA performance clothing brand Second Skins and the Australian Skins performance clothing brand that Sportsnet Holdings is importing. Second Skins maintains that the S in a circle plus the wordmark Skins could cause confusion in the marketplace as it closely resembles their own logo, in use in the local market for several years.